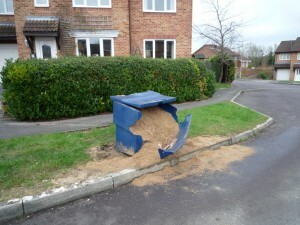 Several weeks ago the grit bin in Linton Drive was damaged but no action taken to repair it. 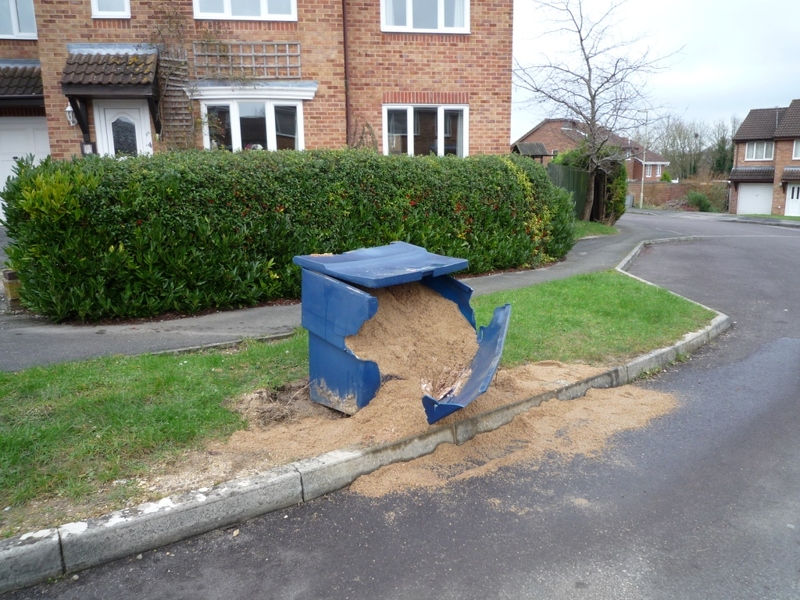 Unlike most parts of Hampshire grit bins in Andover are owned, filled and maintained by Hampshire County Council. Andover Town Councillor Len Gates has referred the matter to the county councillor for the area (Zilliah Brooks) who is waiting for a response from council highways officers. We look forward to the highways department’s response. Hampshire Trading Standards are would like to bring the public’s attention to websites offering Blue Badge parking applications online, and charging a fee of £49. The websites are not affiliated or associated with any local council, or any other official body or organisation. It is not obvious from entering the websites that they are not official, or that an application fee is charged. However, the information is contained in the terms and conditions, and it is recommended that these are looked at before deciding whether to use the sites. There is a fee of £10 per application, but no other charges. Anyone wishing to make a complaint against an unofficial Blue Badge website or to receive advice, should contact Trading Standards via our partners Citizens Advice Consumer Service 03454 04 05 06. Despite widespread local opposition Taylor Wimpey have been given planning permission for a further 350 homes at Augusta Park. The new site was originally reserved for a new secondary school for the town and many residents in Augusta Park bought homes in the mistaken belief this school was to be built. 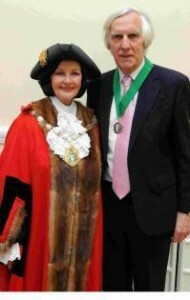 Opposition to the plan was lead by local Liberal Democrats including town councillors Barbara Carpenter and Len Gates. Len spoke against the plans at the borough’s planning meeting when Tory councillors ignored local concerns and voted the proposal through. Full details can be found here and here. Local conservatives continue to dismiss objections while residents ask quite rightly when are they to get the infrastructure every community has a right to expect. Local Liberal Democrats have written to the chief executive of Test Valley Borough Council calling for an explanation and action in the case of disgraced Conservative ex-councillor Ellie Charnley. Mrs Charnley attended a planning on 22nd July 2014 and no other meetings between then and 21st January at which time she was automatically disqualified as a councillor. It also appears she has not attended any Overview and Scrutiny committee meetings, the most important committee for protecting the public’s interests, since 2011. Her lack of attendance was reported on 15th January. Despite this no-one within Test Valley Borough Council was aware that she was automatically disqualified from 21st January. Mrs Charnley attended planning meetings on 22nd January and 12th February. She was not entitled to do so. By allowing this the council has exposed itself to a possible judicial review if an aggrieved resident felt so inclined. On 31st March Mrs Charnley was still listed as a councillor and still referred to as a councillor by officers. Council officers were advised of this and a response requested. A further email of 7th April asked for action. No response has been received. The matter was again raised at a council meeting on 15th April 2015; officers were unaware of the situation and not prepared to give an answer. They eventually replied on 1st May – over three months after Mrs. Charnley ceased to be a councillor. Is the chief executive satisfied with the handling of this matter? Did Mrs Charnley receive her councillor’s pay after 21st January? If so what action has been taken to have the allowance paid back? What action will be taken to prevent a re-occurrence of this? Residents of Camelot Close have rejected claims by local Tories that additional parking spaces have been allocated to them. The reports in March suggest the councillors had recently got planning permission for 12 extra spaces. In reality what happened was that Aster Communities applied to convert an existing open space into car parking. Councillors approved the plans by email just before Christmas. No formal meeting was held to discuss it despite objections from residents concerned about loss of open space used as a play area and the proximity of the new parking to their homes. Andover Town Council and residents commented that the twelve spaces were too narrow. As many residents park vans and large cars at home wide spaces are essential. This may loose two spaces. Twelve becomes ten. Access to the new area is via an existing turning head where two and sometimes three cars currently park. These spaces would therefore be lost. Ten becomes seven. Having received permission for the car park Aster now propose to build three more houses on open green space in the same area leading to a loss (according to Andover Town Council) of a further six parking spaces. Seven becomes one. Finally it is reported that one of the new spaces is to be a disabled space despite no resident asking for an allocated space. One becomes zero. If and/or when both proposal go ahead Camelot Close residents will have lost one paved open space used as a play area, and one grassed open space also used for play and parking. The net gain – one disabled parking space?